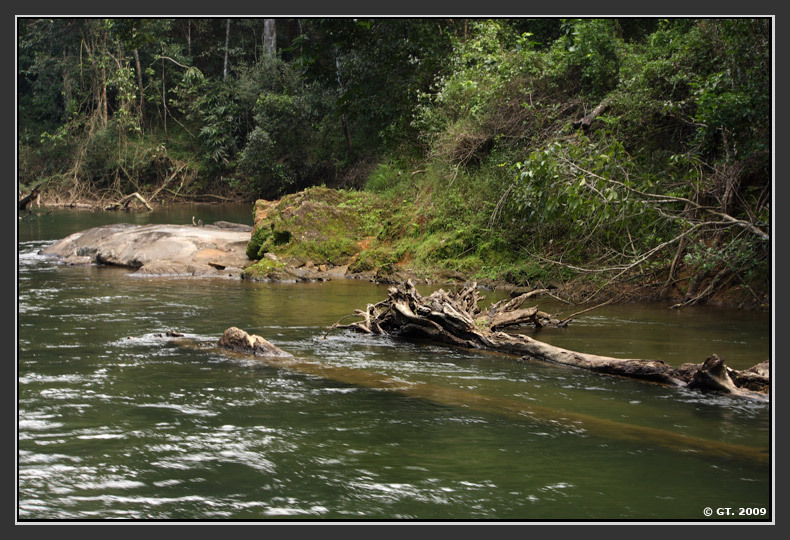 Back in Dec 2012, was part of a photography tour to Valparai and Annamali , deep within the beautiful and enchanting Western Ghats of India, a tour that was organized by Kalyan Varma and Dilan Mandana. 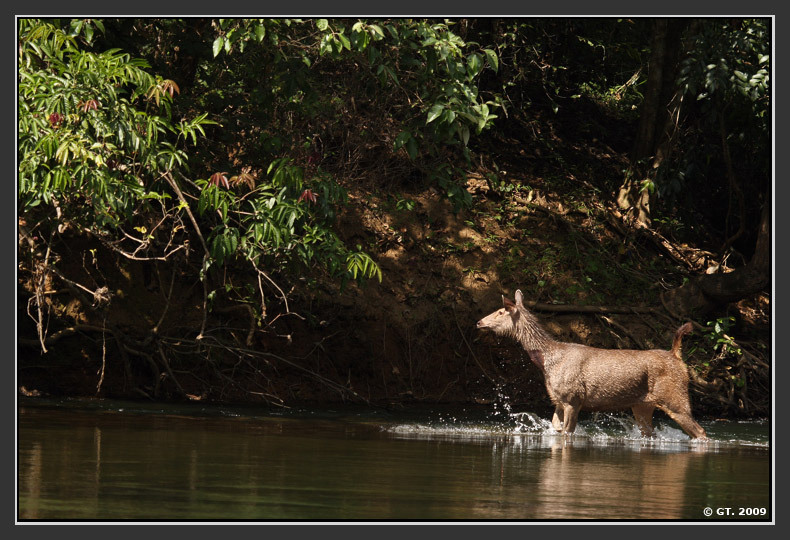 Around 2 pm, as we approached one of the forest guest house on the banks of the Pambar river, the place where we were supposed to have our lunch, we heard alarm calls of a Sambar very close to where we were and knowing that a predator was near by, we rushed towards the direction of where the sound was coming from. 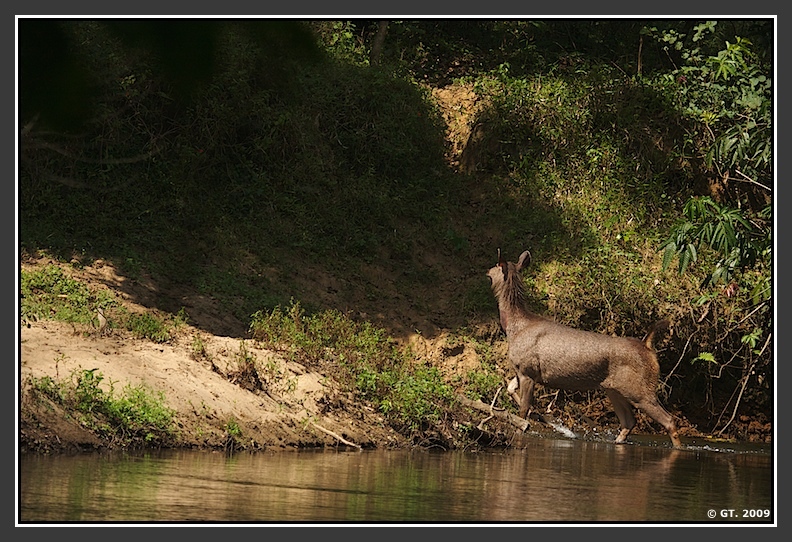 We climbed into and then out of couple of six foot trenches and scrambled through thick bushes to see the Sambar which was giving out alarm calls. 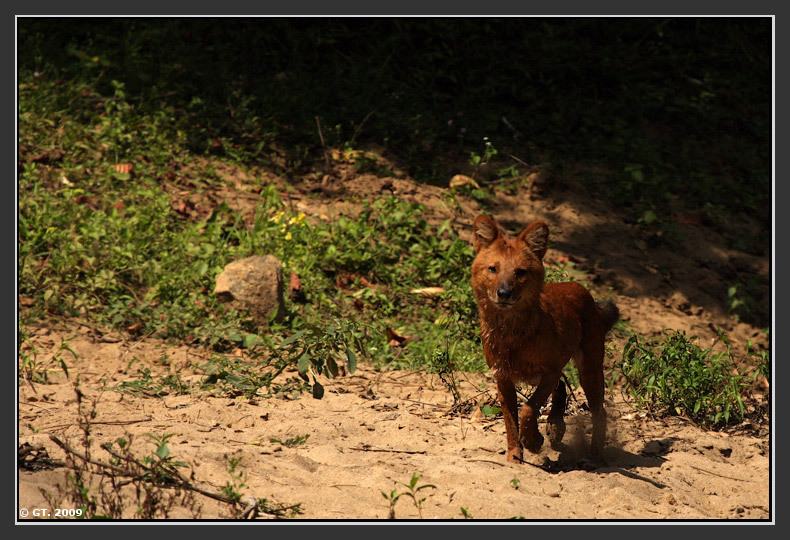 Dholes usually hunt in packs and we were surprised to see this lone member. We waited in our cramped positions, waiting to see if the other members of the pack would show up. 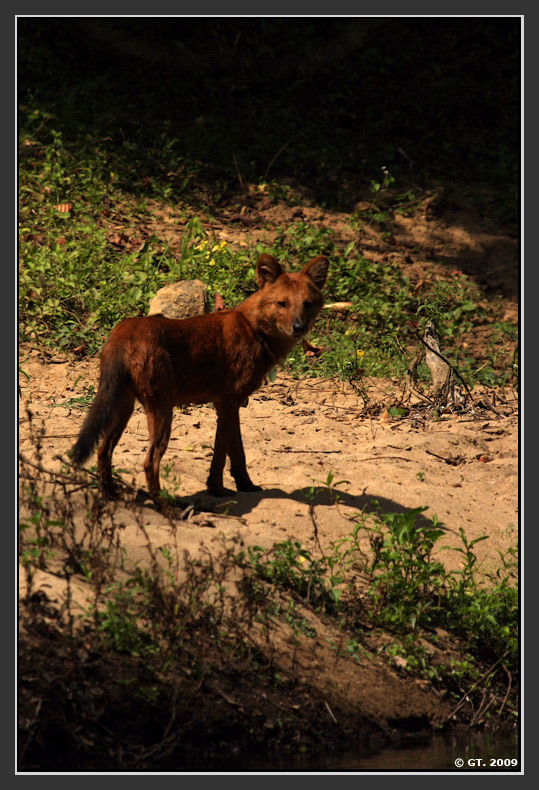 This was the shot of the dhole looking at us directly, trying to figure out who else was there. 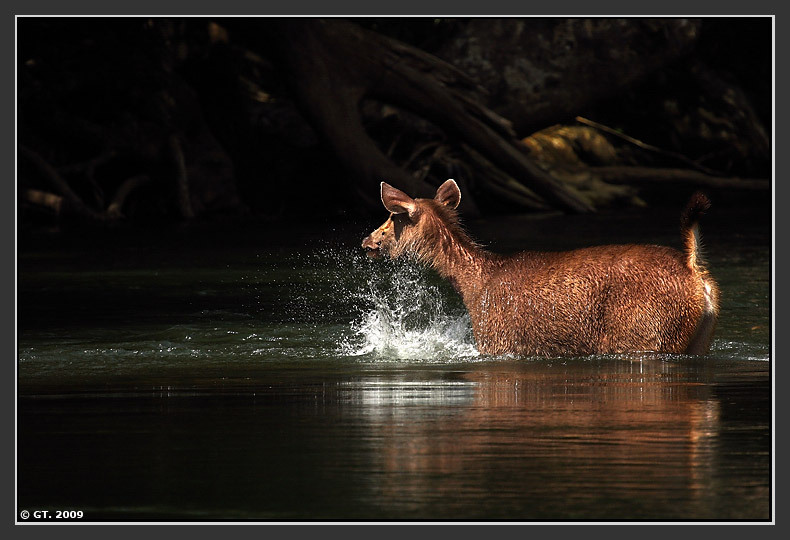 Sambar repeatedly stomped the ground, creating huge splashes. 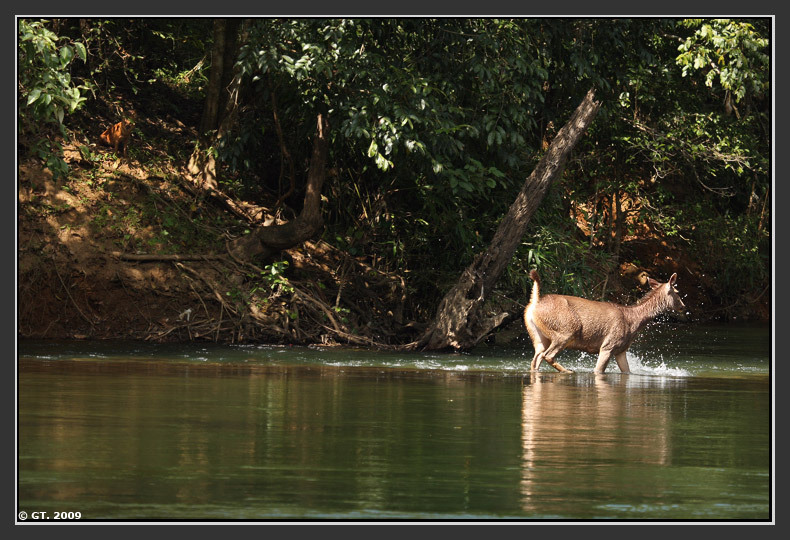 Stomping is a typical way of displaying a warning sign on sighting a predator. But every now and then she would turn to check on her fawn as well. 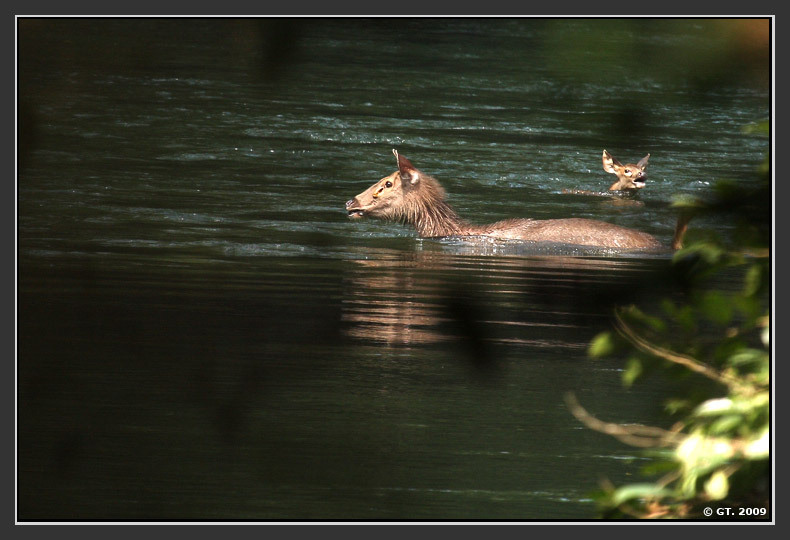 You could clearly see that the Sambar thought of the Dhole as the main threat and hence did not leave her guard to go and help the fawn struggling in the water. 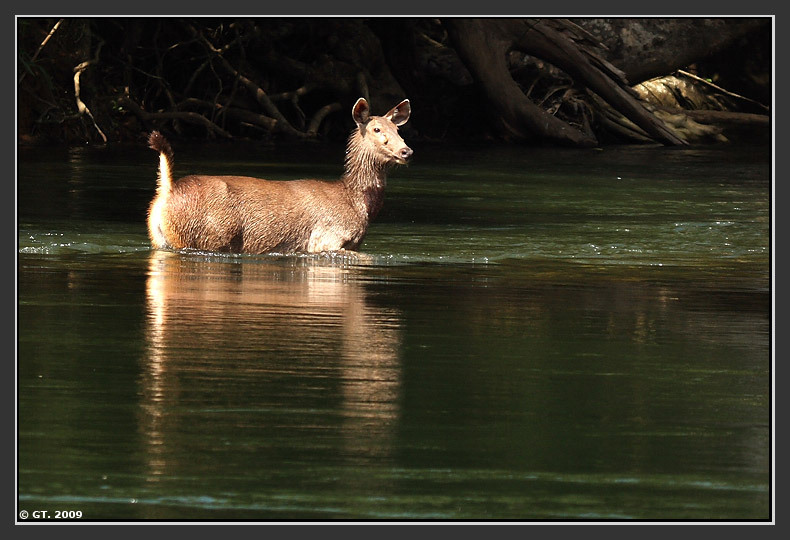 Sambar kept up her vigil… on both the Dhole and her fawn, which luckily had found some shallow waters by then and was standing in calmer waters. 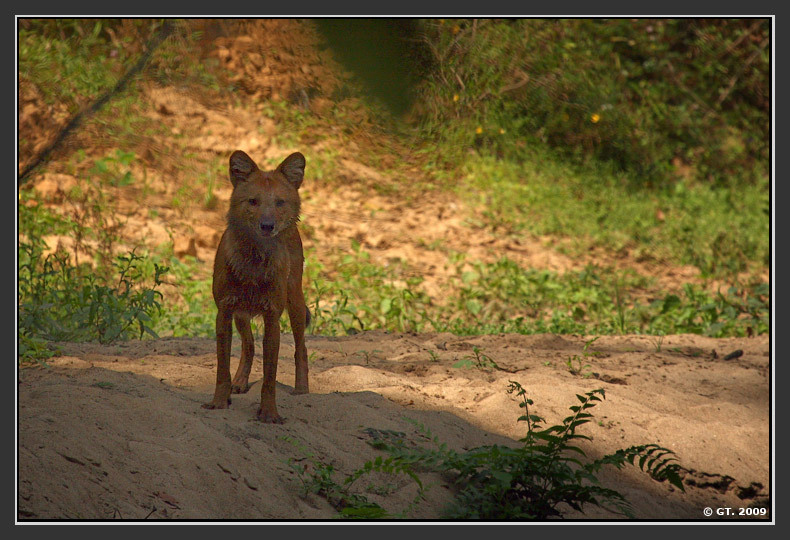 Sambar climbed to the exact same spot where the Dhole was sitting and double checked to see if the predator had really left. 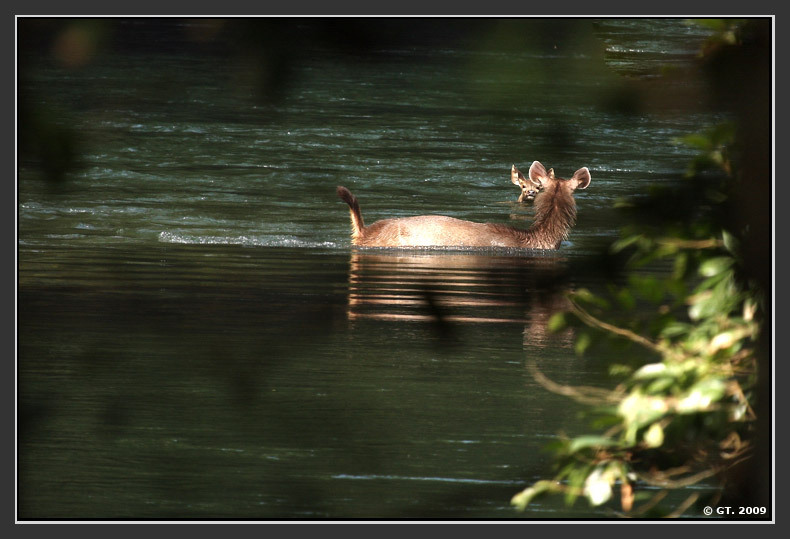 She then turned back and then went towards her fawn …. 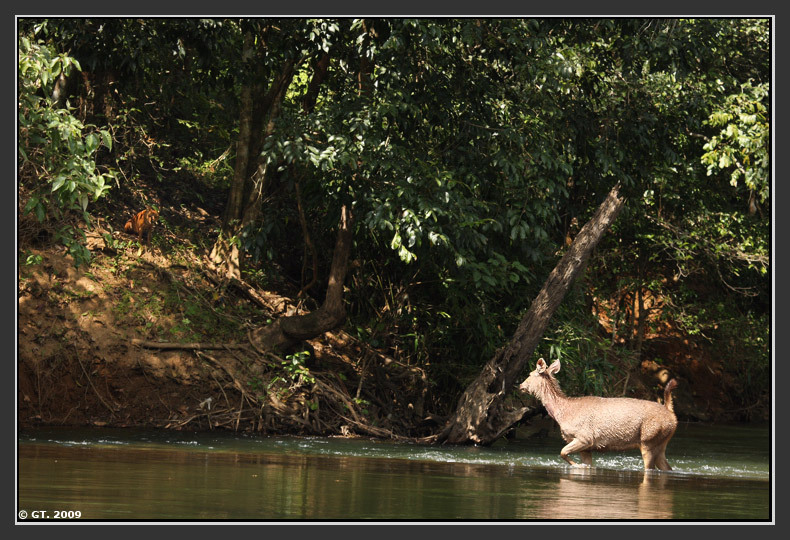 We could not see the Sambar and the fawn after this point, but were pretty sure they both lived to tell their story and the valley turned tranquil as if nothing had happened. 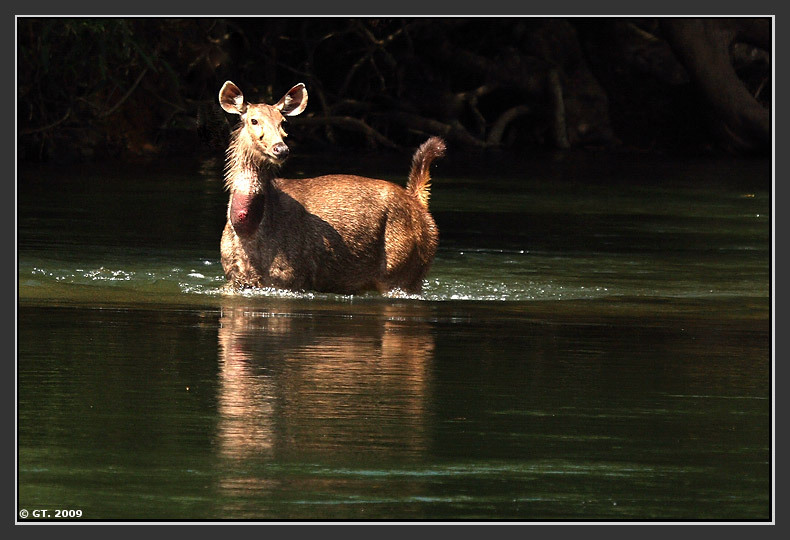 That is how the Sambar mother stood between her fawn and the lone Dhole and lived another day. Fantastic story GT…. wish you all the very best with your future stories.